Julian started his musical career playing the drums aged 11. Despite being thrown out of his music class at high school he achieved something of a reputation in his home County of Warwickshire, England, as session drummer with some diverse ability. He studied drums and percussion at Goldsmiths College London for two years and eventually his career took him to Europe, working with many different artists as drummer or percussionist, touring and recording. Although often heard singing back up vocals during performances it was not until one night in Basle when a bands vocalist failed to arrive for a gig that Julian was persuaded to take to the stage as a singer. That night was something of a turning point and the Julian Tomas we hear now was born. 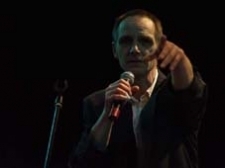 Finding the right genre for this voice proved an interesting and frustrating few years as Julian performed and recorded as a singer songwriter through several genres and bands until in the year 2000 "Julian Tomas and Friends" played a jazz concert at a very upmarket hotel in England. The songs performed were the result of a year of songwriting with the unplugged simplicity of double bass and piano, and were a mix of Julian's emotive vocal and his friends jazz influences. Following gigs and some recording of the project in England the band was invited to Poland for performances in aid of a childrens home there.. and the cd "Portraits of Emotion " was released. guitar at the age of 6. He has toured extensivley through Europe, backing such as artists as the late Godfather of Ska Laurel Aitken. 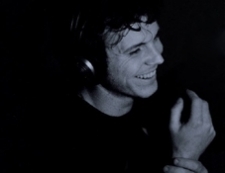 He has since worked in many fields as a performer, musician and Sound Engineer. and projects to young up and coming musicians (www.slyarts.co.uk). Johnny Tomlinson has played piano from the age of 5. 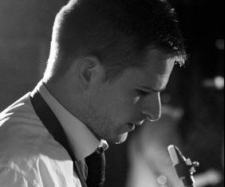 He studied at Leeds College of Music,graduating in Jazz in 2007. 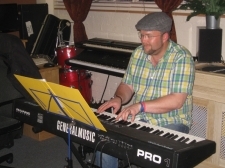 He now lives in London where he works as a pianist, organist, composer and musical director. bands and branched out into other areas such as reggae and dance music with bands "Gentleman's Dub Club" "East Park Reggae Collective". and has played at the Umbria Jazz Festival supporting Marcus Miller and also played at Glastenbury and at the V Festival. A Young and talented musician, he works as a teacher of music. Composer, studio and concert musician. Instruments: tenor and soprano saxophones, akai ewi. Main styles in music: jazz, fusion, pop music. Davies, Mishael Brecker, Chriss Porter and Joshua Redman. Michael started to play when he was 18 years old and active lessons and performances given him a big development in music. He has taken part in a lot of jam-sessions, jass concerts with Ukrainian, Russian and Polish musicians. 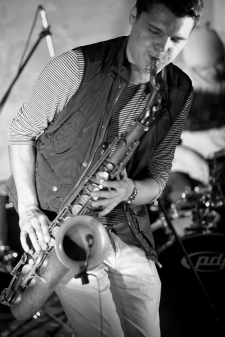 In 2009 and 2010 he has won award in Donetsk competition in “Best tenor-saxophone” and “Best Artist Improvisation”. 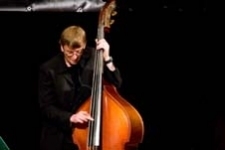 In 2011-2012 he was a participant of Jazz Lviv School (teachers were Michael Bowie (USA Boston) and Frank Parker (USA)). Since 2011 he is playing in “Quartet_Trio”, since 2012 in “Fancy People”. He is an organizer of jazz festivals “Z.Jazz” in Lugansk. In 2013 he was awarded the status of one of the best musicians in Lugansk region in Ukraine. Neil started playing the keyboard at the age of 8. A self taught player, Neil found himself playing in bands from his early teens, and soon realised that jazz was his first love. He has toured and recorded with own bands Afro Elements and Mr. Gone, achieving a No. 1 Album in the Jazz FM charts and many European tours. He has toured Europe and Japan with Eddie Henderson (ex-Miles Davis), Down To The Bone, and Laurel Aitken (with Steve!) among others. Neil retired from playing in 2008 to spend more time with his family, and retrained as a stone carver. He got the call from Julian in March 2013 and decided that the time was right to start playing again. He now spends his time stone carving, and playing piano or guitar. Max Grunhard is a London-based saxophonist, producer and composer. Originally from Sydney, Australia, he has been living in London for the past 10 years. His live performance credits include Prince, Nikka Costa, Spanky Wilson and Quantic Soul Orchestra among others. He has performed at most of London's top venues as well as many international festivals and clubs.